Critical Concentrates Makes an Epic Return! Incredible flavor from Berries & Cream, Tropicleaner, and more! Sundae Driver #19 has arrived and it’s better than ever! Jungle Cake, Wifi Mints, and Wedding Crasher #18 are also making a return this month. Raw Garden is back in stock with full grams of live resin sauce and half gram vape cartridges! Extraordinary flower from the fabulous folks at Northern Emeralds just released! Convenient, considerate, and reliable these Select Oil vape cartridges are a winner! Fantastic Flavors from Flow Kana! New selection of fabulous greenhouse cannabis including Strawberry Banana OG and Rose Gold from Flow Kana! We just received an amazing drop of exotic flowers indoor grown by The Village including WiFi Mints, Wedding Crasher 18, Str8Lemonade, & Jungle Cake. Amazing Drop From The Village! We have a phenomenal batch of flowers grown masterfully by The Village! Wifi Mints - (Wifi 43 x Animal Mints) - Amazing fuel and mint exhale! Strawberry Banana - (Banana Kush x Bubblegum bred by Reserva Privada) - Very tasty bubblegum taste and balanced euphoric high. Banana Punch 9 - (Banana OG x Purple Punch F2 bred by Symbiotic Genetics) - Tropical pineapple flavor and tranquil indica effect. Wedding Crasher 4 - (Wedding Cake x Purple Punch F2) - Kushy aroma and soothing relaxing indica high. Mimosa V6 - (Clementine x Purple Punch F2) - Delicious citrus and haze flavor along with a soaring euphoric 'productive' high. OG Kush - (Classic clone-only kush. Unknown genetics) Old school kush exhale along and a relaxing medicinal body high. 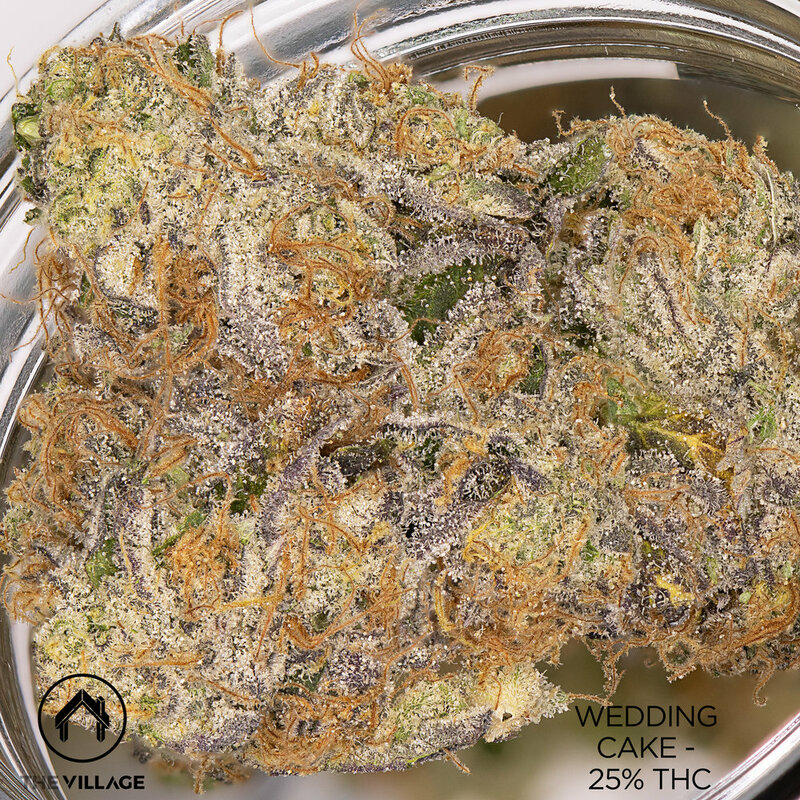 Wedding Cake - (Triangle Kush x Animal Mints) Delivers the strongest indica buzz on our menu. Tasty kush terps with hints of marshmallow and vanilla. Motorbreath 15 - (Chem D x SFV OG) Woodsy fuel flavor and a strong buzzing body and cerebral high. Pictures and descriptions by Eric Solomon. These Mimosa V6 cartridges took 2nd place at the Santa Rosa High Times Cup. Lip-smacking flavor & remarkably strong. Sundae Driver 19 and 20 grown by The Village are currently available. Very exotic! This batch of Super Lemon Haze by The Village took 2nd Place at the 2018 High Times Cannabis Cup in Sacramento! Banana Punch 9 ice water hash grown by The Village and extracted by Jungle Boys Full Melts. World class quality! Epic collaboration from The Village x Moxie! Mimosa V6, Garlic Cake, & Sundae Driver 19 x Purple Punch. All natural ‘Thai Sticks’ by The Village x Artisan Canna Cigar are currently available. Sundae Driver 19 x Mimosa V6, Sundae Driver 20, & Super Lemon Haze.